At Chetas, we help municipal bodies turn their water distribution network into a viable commercial model. While the municipal establishment benefits from improved and consistent revenues, consumers get to experience better quality service. Our integrated offering covers the Supply, Installation, Testing and Commissioning (SITC) of ClassB EEC approved water meters, including house-to-house installation. Further, our work also includes Monthly Maintenance, Meter Reading and Billing activities. We say, with a touch of pride that we are the only company in India to have successfully completed the first ever Privatization Project of water metering in the Kalyan-Dombivali Municipal Corporation, Which includes Supply, Installation, Six years monthly maintenance and Six year monthly reading and billing of 22,000 consumers. Extending the concept, we also take up the SITC of EEC approved Bulk meters for industrial clients. Chetas commands unchallenged leadership in the area of Ultrasonic Flowmetering Technology in India. 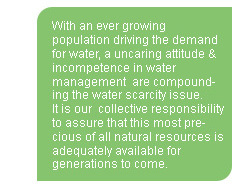 We leverage this market position to turn the concept of foolproof water management into a reality. We wholeheartedly believe that this is possible only when there is absolute transparency and accountability in the entire water distribution system. Towards this end, we take up the SITC of Ultrasonic Flowmeters. We have a hand-on approach to our clients' needs and concerns. How Municipal Establishments/ Water Supply Boards benefit? How State Irrigation Departments benefit? Study & implementation of un-interrupted 24 x 7 water supply system at desired pressure with improvement in the level of services to the water consumers in the city.  Replacement of world class meters, service connections, operating valves & pipe lines etc.  Operation & maintenance for longer span.